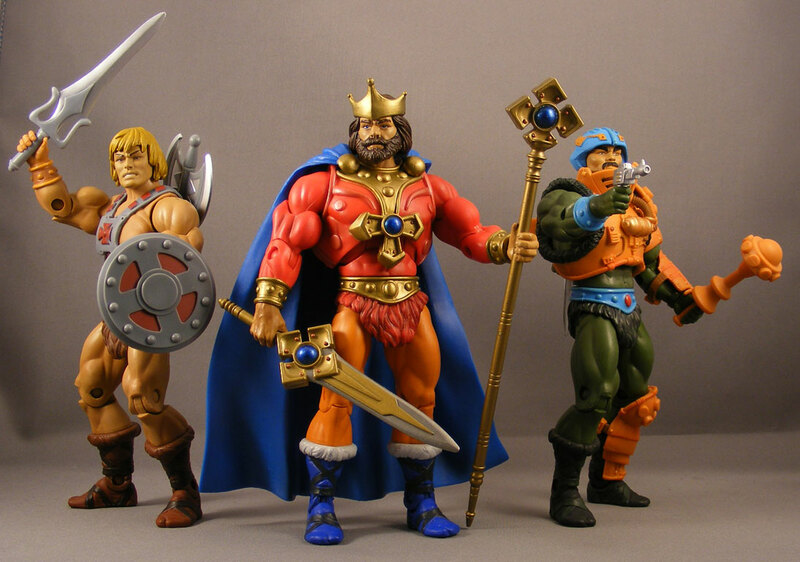 The original Masters of the Universe toy line went through a mere six waves from 1982-1987 (OK, seven if you count the two “Laser Light” figures that were never released in the U.S.). The last wave offered a much more diverse assortment of characters than the previous waves, from Scareglow to King Hiss to Snake Face to, well, Gwildor. 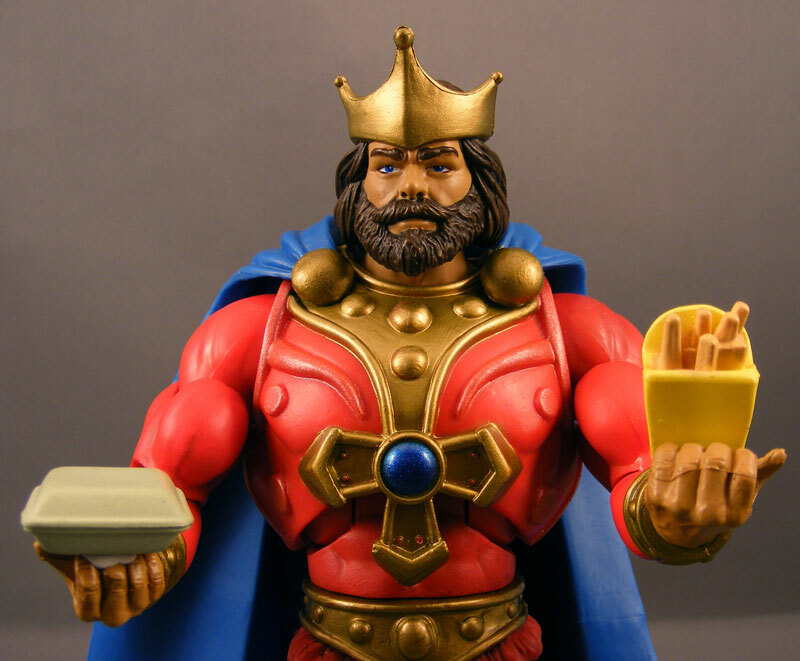 And it also finally gaves MOTU fans a figure of one of the prominent characters in the cartoon series: Prince Adam’s dad, King Randor. 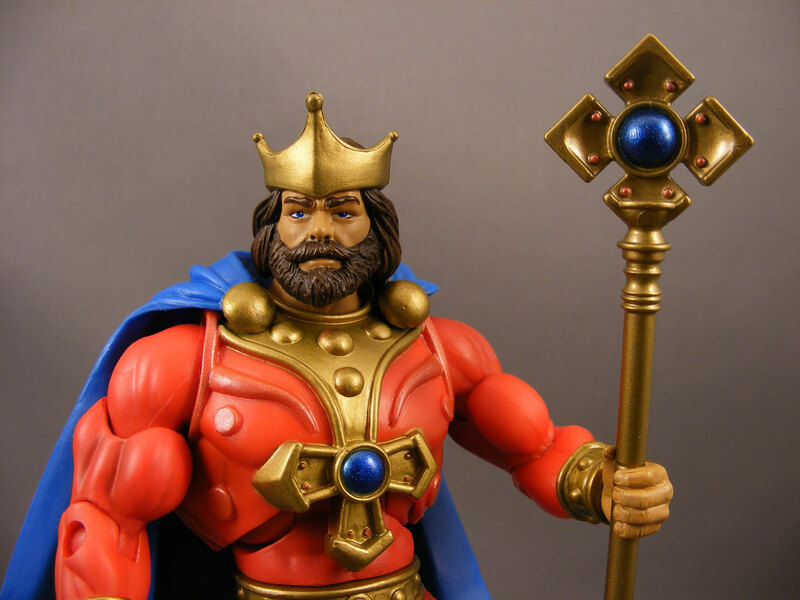 Of course, King Randor goes as far back as the original He-Man and the Masters of the Universe Bible, written by Michael Halperin in 1982 before the cartoon was even created. He’s appeared since then in every incarnation of the He-Man story, including the New Adventures (where, in the first episode, he and his wife Marlena finally found out the truth about their son Adam). Since those early days, Randor’s history has been greatly expanded. We now know that Skeletor was once in fact Keldor, Randor’s half-brother, and that Skeletor’s facial deformity is a result of a battle with Randor. (Keldor may even be the true ruler of Eternia by birth, but the Elders rather understandably interceded with the right of succession). 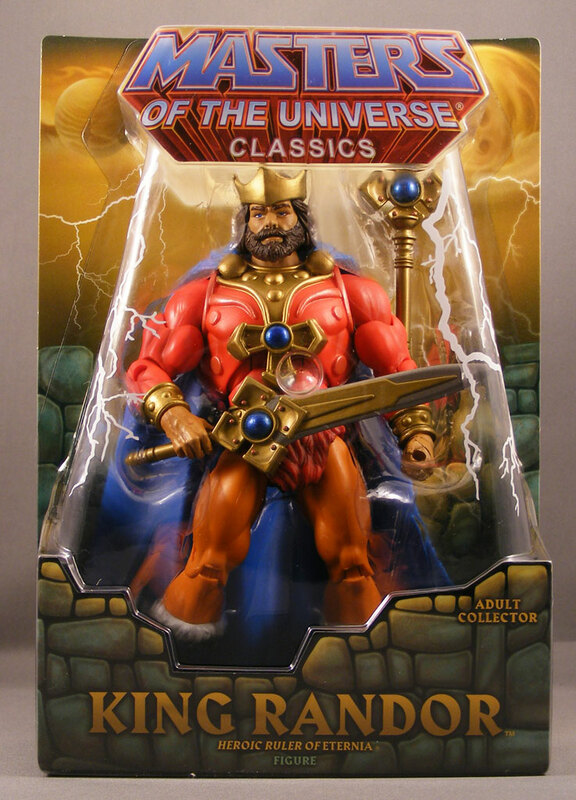 Packaging: No changes have been made to the standard MOTUC packaging, so Randor will fit right in with your MOC collection, if you happen to have one. I don’t. Design & Sculpt: The Four Horsemen’s Randor is closely based on the original figure. The deviations from previous MOTUC figures include the head, the cape (which is new), and of course the armor. 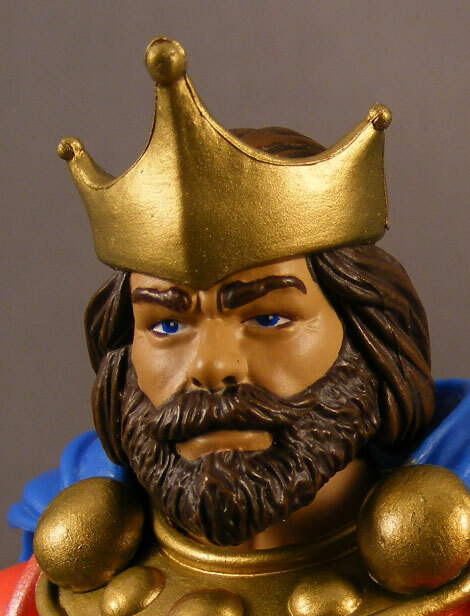 The head sculpt is excellent as always, capturing Randor’s bushy-bearded, fatherly demeanor. Though the crown of the 1980s figure was removable, this one isn’t. The armor for the 1980s Randor was re-used from Jitsu, who had been released years earlier. The Horsemen have altered the armor here to make it more specific to Randor, adding cross-like elements (to match the accessories) and a blue jewel. Unfortunately, now that we know–from Evil-lyn–that Mattel isn’t above re-using an unmodified sculpt to the detriment of the character, I wouldn’t be surprised to see this identical armor show up on a MOTUC Jitsu. Plastic & Paint: There’s no question MOTUC figures look and feel more like toys than many of their fellow toy lines, but that’s just part of the MOTUC style. Still, that toyishness is especially noticeable on figures as colorful as this. The red arms and armor and the orange tights highlight that toyish look. And yes, he looks a heck of a lot like a certain fast food mascot. Seriously, how many characters can you think of with a red, blue, and orange color scheme? Randor ends up looking quite striking among the rest of your MOTUC collection. There’s not a lot of intricate paint work here, except on the head. The paint work on the head is a little gloppy, and the eyes look a bit off upon close inspection; it’d be nice if Mattel could get the factory to be a little sharper here. 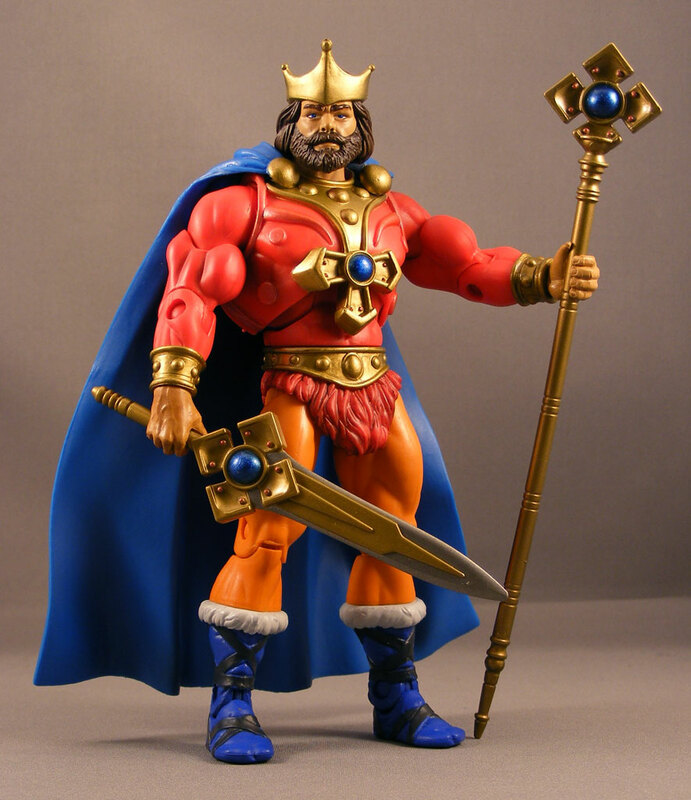 Articulation: Randor has ball joints at the head, shoulders, and hips; swivels at the biceps, waist, wrists, top of the hips and the boots; and hinges at the elbows, knees, ankles, and abdomen. The ankles also have good side-to-side movement, and the ball jointed head works well despite the cape. 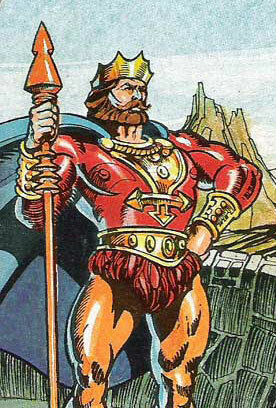 Accessories: Randor comes with a sword and a staff. Both of them seem to be stylistically inspired by the cross motif the Horsemen created for Prince Adam’s wand in the 200X line, which was presumably inspired in turn by the cross on the classic He-Man’s Power Vest. The style and shape of Randor’s sword also resembles the smaller, “non-transformed” sword that came with the 200X Adam. 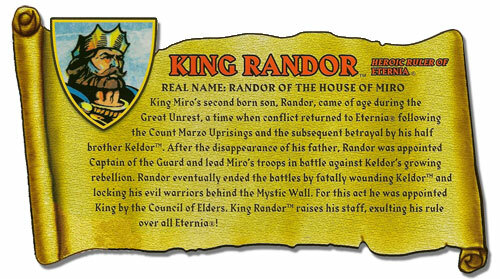 Yet again we get a staff, but in this case it’s relevant, since the original Randor did come with one. 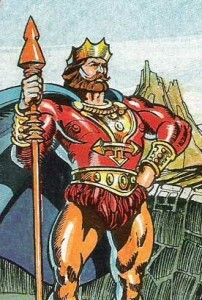 And kudos to Mattel for splurging on a unique staff for Randor, rather than the staff that will eventually go with Whiplash (the original Randor came with a reuse of that staff). All that said, I have to agree with some fans who have said the Horsemen seem to go overboard with the rivets–in this case on the crosses themselves (and even on the armor). Both the sword and the staff have some nice paint work, particularly on the blue jewel. Quality Control: I had no problems with my Randor. 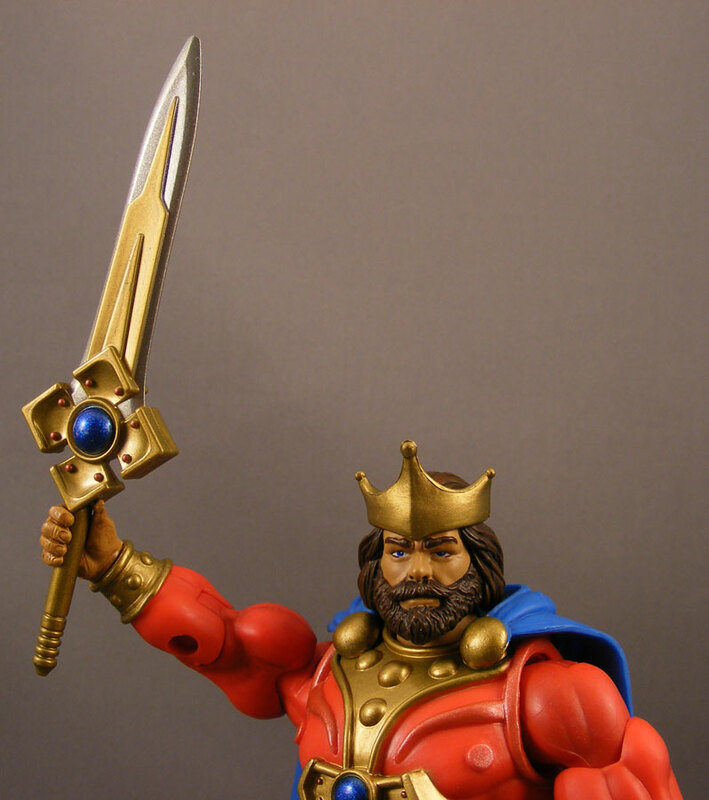 Overall: King Randor was a pleasant surprise for fans of the cartoon when he appeared in the last U.S. wave of MOTU figures in 1987. Mattel seems to be trying to make it up to fans for the scarcity of that wave by putting Scareglow and Randor in the first year of MOTUC. Personally, I don’t find Randor all that exciting, but he is a fan favorite and an essential members of the MOTUniverse, so he’s more than welcome in my collection. I like him alot, almost as much as the last picture. I really like the figure, but I wonder why they changed the staff. Nice review. The figure is a so-so for me. Just like you said, I don’t find Randor that exciting. The heavy cape (seems to me havier than He-Ro’s is kind of a letdown. I did like how they made his crown ressemble the Filmation one a lot, though. On a side note, though I had a lot of fun maniping a “Burger King Randor” logo months before the figure was revealed, I still can’t see THAT much of a similarity to the mascot. Lol at the burger accessories at the end.I kind of like the older figure’s head with the chiseled features,this new head looks more like Hacksaw Jim Duggan.Great review! Nice review, Poe. There's hints of the cynicism that characterize the reviews of your compatriots at OAFE, and although they are perhaps justified, I would hate to see your reviews take on the same (I find unreadable) tone. I like how the lack of excitement shows up in the review. I also liked the last picture! I didn't intend the review to sound so unenthusiastic, I suppose is the word…but yeah, Randor isn't a character I was excited about. Still, he's a pretty good action figure, just not the best we've seen from this line. As for the "cynicism," it's better to day it's disappointment. Maybe my Jitsu remark was off-base–only time will tell. randor rules… you can almost hear the michael mcdonald music in the background and smell the ice blue aqua velva… he's like the captain, and only missing his tennille. @dayraven: Props. Made me laugh but good! I don't plan on buying Jitsu if he's made. But if they use the exact same armor from Randor I don't think it would look right on Jitsu!